Workers installing solar photovoltaic panels. First Solar Inc.
"The tariffs continue to be punishing American consumers and American industry. ... It needs to stop," Gardner said when asked about the report from the Solar Energy Industries Association and Wood Mackenzie Power & Renewables, which found utility-scale installations dropped below 1 gigawatt for the first time in three years because of the tariffs. He called the tariffs a tax on the American people and said the issue would come up during broader debates about trade agreements. "I've encouraged the White House to, yes, penalize China and change China's bad behavior but stop the tariffs," said Gardner. Gardner's views are shared by senators from both parties in solar states who have released letters publicly slamming Trump's executive action in January, which established a 30 percent fee on solar imports that phases down over a four-year period. Other lawmakers, like Sen. Sherrod Brown (D-Ohio), urged Trump to take strong action against China to help solar manufacturers (E&E Daily, Jan. 24). Sens. Martin Heinrich (D-N.M.) and Dean Heller (R-Nev.) introduced legislation this year aiming to repeal the trade barriers. That language has not moved, but there has been a flurry of recent letters sent to the Senate from companies seeking exemptions from the tariffs. Last month, 11 companies sent a letter to Sen. Thom Tillis (R-N.C.) requesting he meet with Trump and U.S. Trade Representative Robert Lighthizer about the issue. The report concluded that utility-scale solar installations dropped 15 percent from the same period last year. 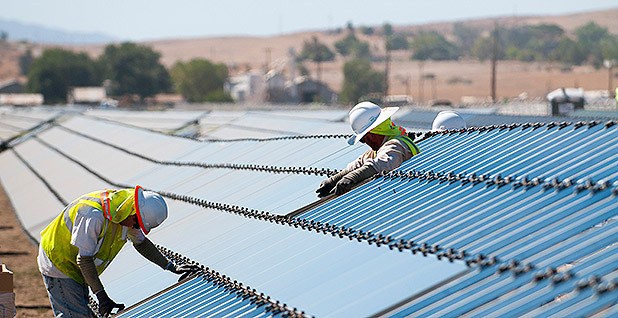 Cory Honeyman, Wood Mackenzie Power & Renewables director of solar research, said uncertainty in late 2017 and early 2018 from Trump's trade policy prompted developers to delay "shovel ready" solar projects until late this year or early next year. Yet some tariff effects were not as bad as predicted. Overall, experts said they expect 2018 to experience flat solar growth. Cypress Creek Renewables and some other companies have announced project cancellations because of tariffs, but analysts had expected more terminations, according to Honeyman. "The bigger effect that was expected, but has played out to a greater extent than initially thought, is the amount of projects that simply delayed completion dates," Honeyman said. Other companies announced plans for U.S. solar manufacturing facilities this year, prompting Trump supporters to proclaim the tariffs are working. "The tariffs have provided a powerful stimulus to the domestic solar manufacturing industry, with about a dozen companies planning manufacturing investments today," Jeff Ferry, research director at the Coalition for a Prosperous America, said in a statement this fall. Going forward, analysts are projecting the fourth quarter will be the largest for utility solar since the end of 2016, as more of the delayed projects come online. Declines in module costs because of a shift in China's feed-in tariff policy are countering some of the effect of U.S. trade policy. Next year is projected to be "the most heavily impacted" by tariffs, as developers look to procure modules at lower 2020 tariff rates and benefit from the investment tax credit, according to the report. The long-term picture is bullish for the solar industry though. By 2023, installed photovoltaic capacity is expected to more than double, the report said.